If you’re visiting Lake Garda in summer, make sure you spend a night at Rifugio Nino Pernici! Welcome to the summer edition of our Lake Garda hiking project, where we hike around Lake Garda during all four seasons! There’s a place in the world where the mountains meet the Mediterranean. Where olive trees grow in the shadow of 2000-meter high mountains. Where olive and palm trees surround German beer houses, and you’ll find pizza and sauerkraut on the menu. A place where you can hike in the morning and swim in the afternoon, or enjoy some of the best adventure activities of your life. I’m talking about Lake Garda – specifically, I’m talking about the northern part of Lake Garda, belonging to the Trentino region. Garda Trentino has less than 10 per cent of the total surface of the lake, but reasons to visit Lake Garda are endless – from WW1 fortifications to sailing, kitesurfing and windsurfing (winds are guaranteed pretty much year round), and naturally, hiking! The northern shore of Lake Garda is surrounded by peaks reaching up to 2000 meters – making for quite a sight, considering that the lake itself is at sea level. The mountains look like endless cliffs, rising to the heavens from the ruffled blue-green waters of the lake – and naturally, as hiking lovers, we always feel the pull to explore. GardaTrek is a recently-developed set of hiking trails covering the mountains and valleys overlooking the northern part of Lake Garda. There are three circular trails in total, varying in height and difficulty – the Low and Medium Loop can be walked year round, whereas the Top Loop, traversing ridges and mountaintops, can only be covered in summer. 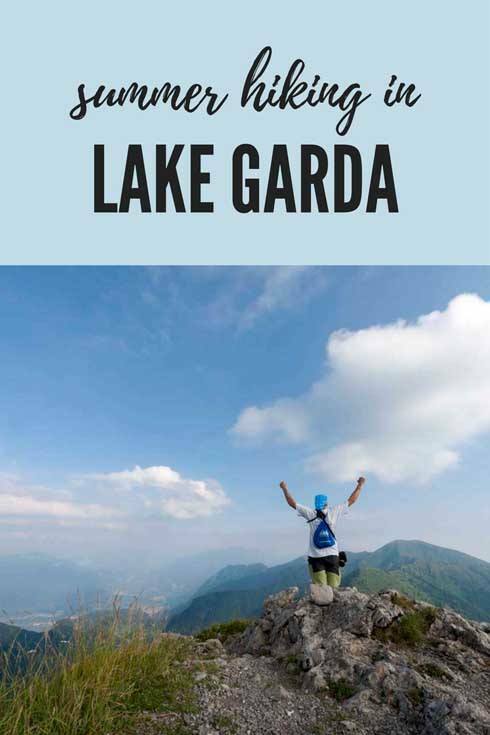 Last July we visited Lake Garda, with the plan to cover the first stretch of the GardaTrek Top Loop, heading from Riva del Garda to Rifugio Nino Pernici. The trek involved a gruelling 1600-metre ascent up a narrow valley, and then followed ridges and crests all the way to the mountain hut – hiking time was estimated to be around 7 hours. Normally, we’d welcome the challenge – a 7 hour, 1600 meter elevation hike is hard work indeed, but nothing we haven’t done before. Climbing Mount Tai in China or Pic Boby in Madagascar involved similar efforts. Yet, there was a little problem – Lake Garda was hot and humid, with temperatures in excess of 30 degrees, a hot, gusty wind and no water sources along the way. Our guide Andrea recommended changing plans. That meant we wouldn’t be following the entirety of the Garda Trek stage, but we didn’t fancy lugging our body weight in water and traipsing the woods while sweating our soul away. So, we decided to ‘cheat’ a little bit, and we drove past emerald Lake Ledro to Malga Trat, a mountain farmhouse producing homemade cheeses. From Malga Trat we climbed a mere 200 meters to Rifugio Nino Pernici, our destination for the night, following an easy path climbing gradually through an oak grove. We got to the Rifugio barely after 20 minutes – not much of a hike, I hear you say. Well, our adventure was yet to begin. 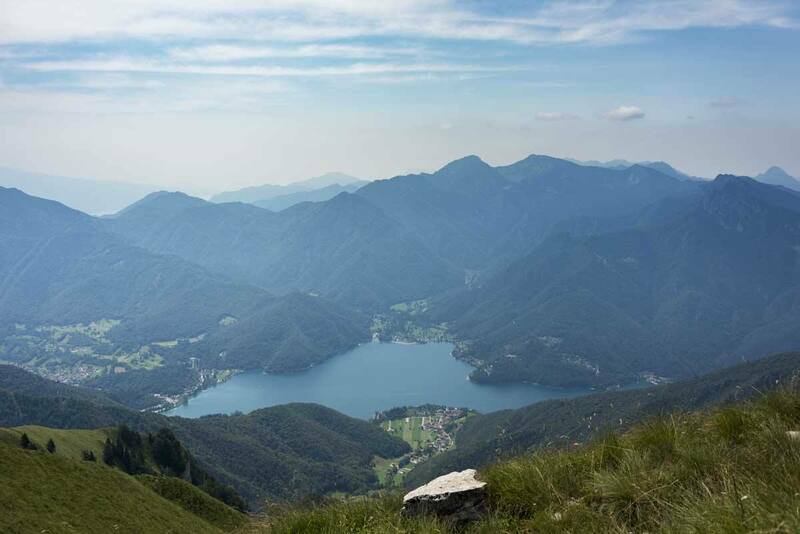 Andrea recommended hiking part of the first stage of GardaTrek in reverse, from Rifugio Nino Pernici to Bocca Dromaè, following the ridges connecting mountaintops, with amazing views over Lake Garda and Lake Ledro throughout. 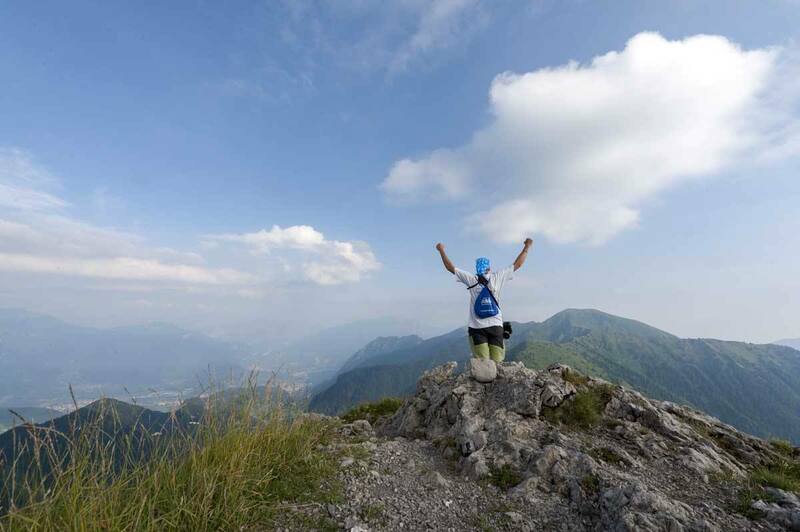 Lake Garda Mountains – 3 Summits in 1 Day! 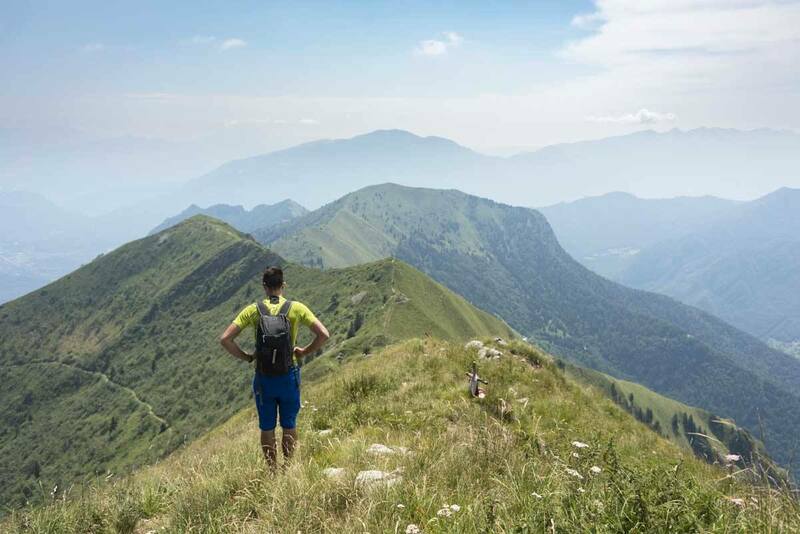 ‘Hiking in the mountains is supposed to be fun, not a chore’ – said Andrea – there was no point in covering the first stage of GardaTrek in that heat. Therefore, after a quick coffee, we left the Rifugio behind us and headed down path 413 towards Cima Parì, the first of the three peaks we would conquer that day. The trail climbed gently, crossing mountain pastures where black and white sheep and honey-coloured horses were grazing in the sun. The path was well marked and easy to follow, alternating sections cutting across the mountainsides and steeper, rocky stretches – in approximately one and a half hours we were touching the cross marking the summit of Cima Parì, at an altitude of 1991 meters – about 500 higher than where we began our hike. From the summit, the view was breathtaking. There were mountains all around us, green and blue coloured peaks, becoming progressively paler as we looked towards the horizon, where they blended with the light blue haze of the sky. Lake Ledro was shimmering right below us, its irregular melting-heart shape reminding me of a Dali painting, while Lake Garda was only just visible, veiled by the morning haze. 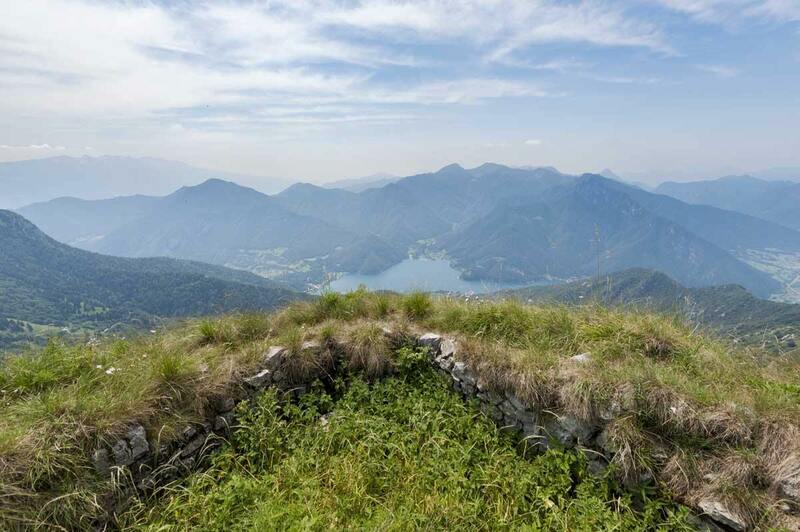 On hot days, you can also see Lake Tenno from the top of Cima Parì, Andrea said – making it one of the few summits in the Alps where you can see three lakes. Afterwards, or trail followed the ridge all the way to Cima Sclapa, about 150 meters below. 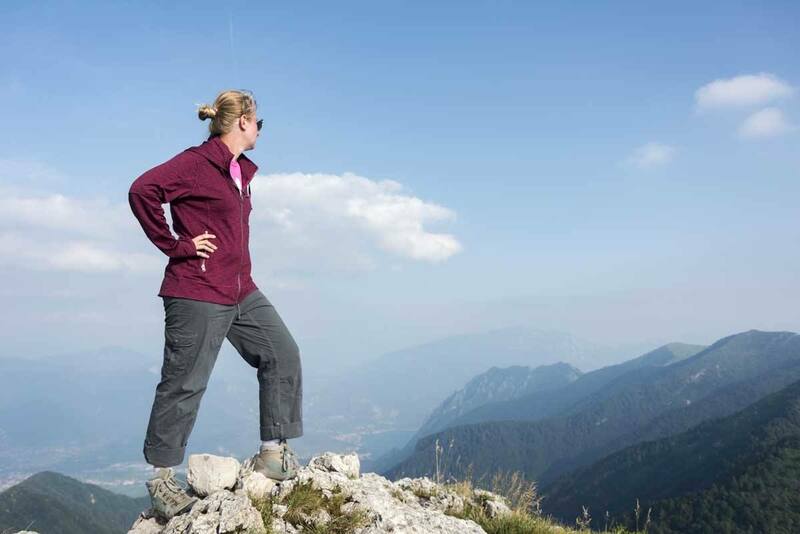 Ridge trekking can be unnerving at first – after all, we were walking on a narrow strip of land, with steep slopes on both sides – but it was the views, the breeze, the wildflowers, the atmosphere of the mountains and Lake Garda in summer made us both feel relaxed and at ease. After half an hour or so walking across ridges and along WW1 trenches we reached the second summit, and from there we continued until we got to Bocca Dromaè, where we turned back down path 413 circling the mountainsides, covering the two-hour distance back to Rifugio Pernici in a further two hours. 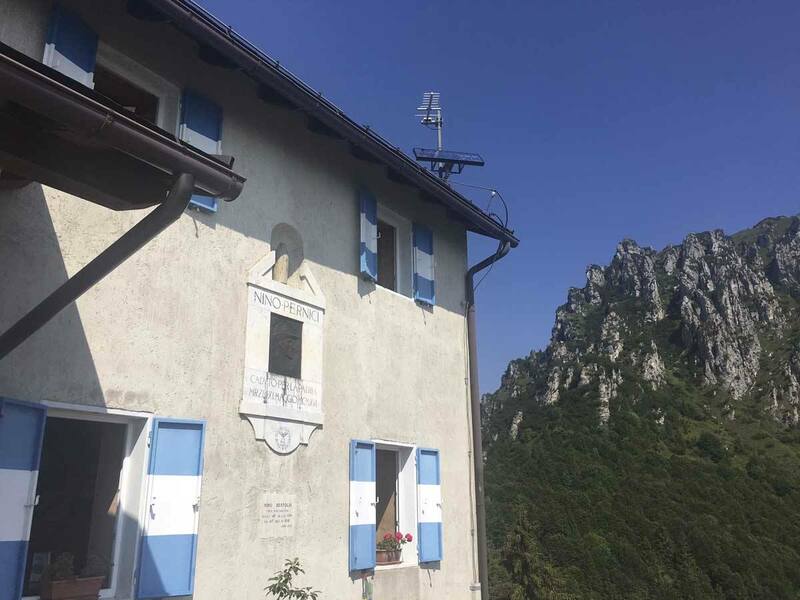 It was approximately 4 pm when the pale blue and white shutters of the Rifugio came into view, and most people would have called it a day – but not us. The sun sets around 9 pm around Lake Garda in summer, and finding ourselves with an extra 5 hours of sunlight, we set off to conquer another summit – Mazza Pichea, a rock ‘finger’ located 300 meters above the Rifugio, in the opposite direction from the trail we had just taken. The two trails couldn’t have been more different – the one we walked earlier in the day was undulating, open and scenic, while path 420 to Mazza Pichea was steep and rocky, with no views to speak of, bordered by flaming rhododendron bushes and dwarf pino mugo plants. The late afternoon breeze mounted the slope to ruffle the pine needles, the rhododendron petals. The last ten minutes to the summit climbed almost vertically on the open rock, with the aid of fixed ropes – something that newbie hikers might want to avoid. Nick celebrating our 3 summits in 1 day! From the summit, Rifugio Pernici was clearly visible, looking like a toy house surrounded by greenery 300 meters below. On the way back we stopped to visit an Austrian fortification that had been taken over by sheep, a small cave where Austrian soldiers spent two winters during WW1, defending the front from Italian soldiers coming from the south. 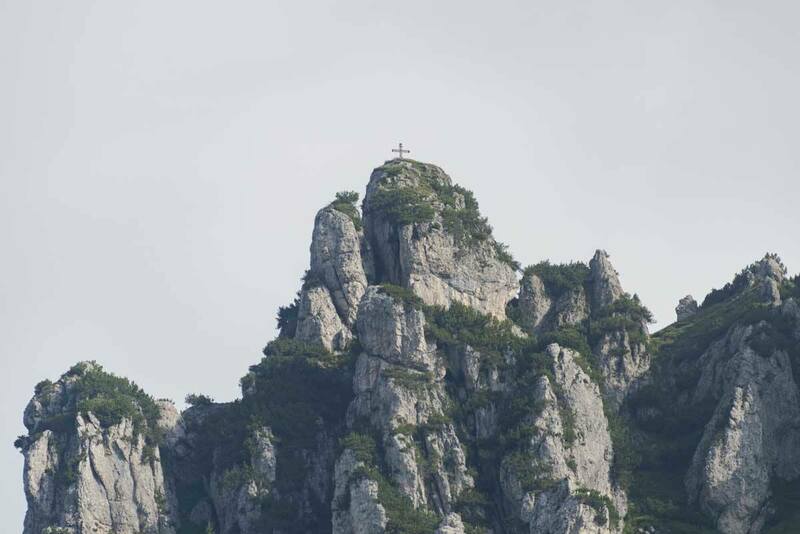 The mountains surrounding the Trentino section of Lake Garda were part of the Italian front during WW1, marking the border of the Austro-Hungarian Empire and the Italian kingdom. 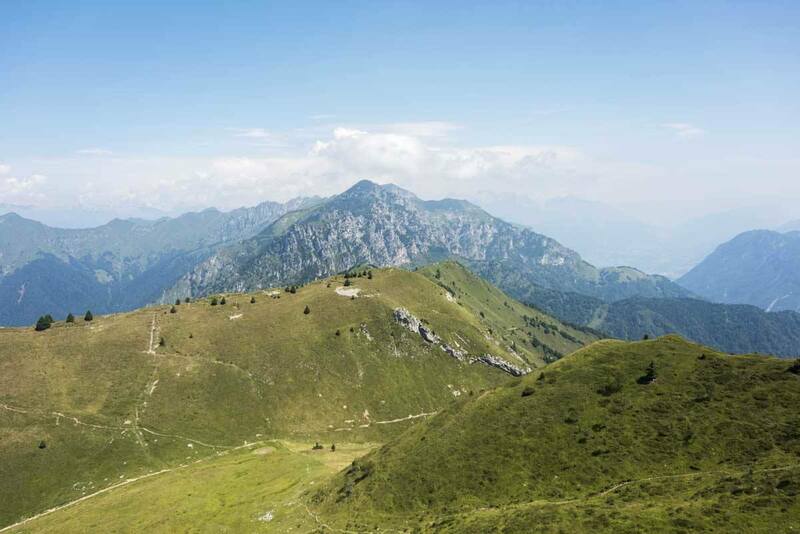 Some of the fiercest battles of WW1 were fought in the trenches and forts in these mountains, before Italy won and Trentino and South Tyrol were annexed. Back at Rifugio Pernici, the rifugista Marco De Guelmi welcomed us with a huge smile and told us that the area is very popular with WW1 history buffs, with reenactments being held almost weekly in summer. Most Italian rifugi (mountain huts) are owned by mountain clubs – the rifugisti prepare food, clean the huts, keep the dorms in order. Basically, they run the show. More often than not, rifugisti tend to be rough around the edge characters, ‘hermits’ who chose to escape the city and live a life in the mountains – like formidable Piero that we met at Rifugio Cespedosio. Marco was a true mountain lover, and he loved spending time with his guests and sharing secrets about his very own corner of the Alps. Dinner comes early in Italy’s mountain huts, and by 7 pm we were sitting in the dining room. Marco’s mother ran the kitchen – we opted to try polenta con formaggio fuso (melted cheese), sausages with homemade sauerkraut and our very own favourite, strangolapreti (meaning ‘priest stranglers’), tasty dumplings made with spinach, ricotta and stale bread, drowned in butter. 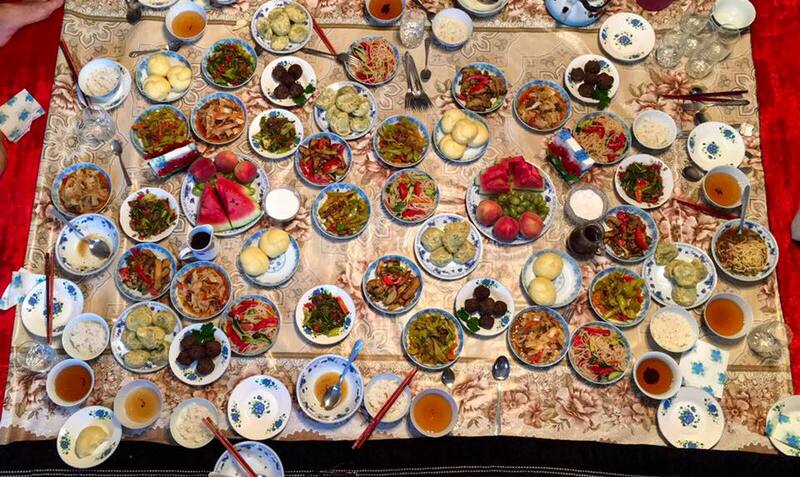 Everything was fresh and tasty and after such an exhausting day on the trails, we fell asleep before it even got dark. The following day, we made our way back down to Riva del Garda following path 402, a long trail snaking its way down the mountainside to the village of Campi through a forest, and then further down to Riva del Garda. The trail was pleasant enough, but the day was even hotter and more humid than the previous one, and the landscape was covered in clouds and haze, in stark contrast with the stunning vistas we enjoyed the day before. When we said goodbye to Lake Garda, the sun was once again starting to break through the clouds. We will be back soon, we thought, before driving off into the setting sun. If you’re driving, make your way to Riva del Garda – we took the SS45 Bis Gardesana Occidentale from Brescia, a scenic road running along the lakeside. An alternative is the A22 motorway, recommended if coming from Verona or Venice. From the Rovereto Sud exit, follow signs for Riva del Garda. 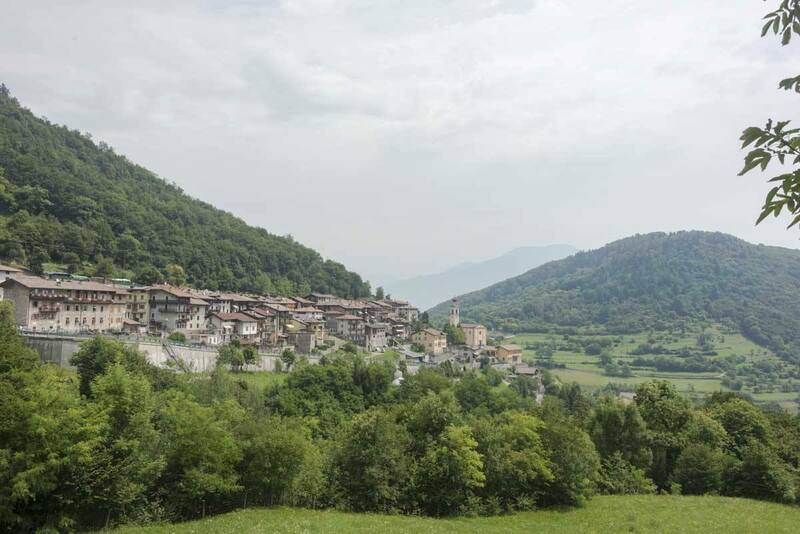 If you’re coming by public transport, you can take the train to Rovereto and connect with a local bus service. There are also buses from Brescia and Verona to Riva del Garda. Once in Riva del Garda, if it’s not too hot, you can hike to Rifugio Pernici following the first section of the GardaTrek. 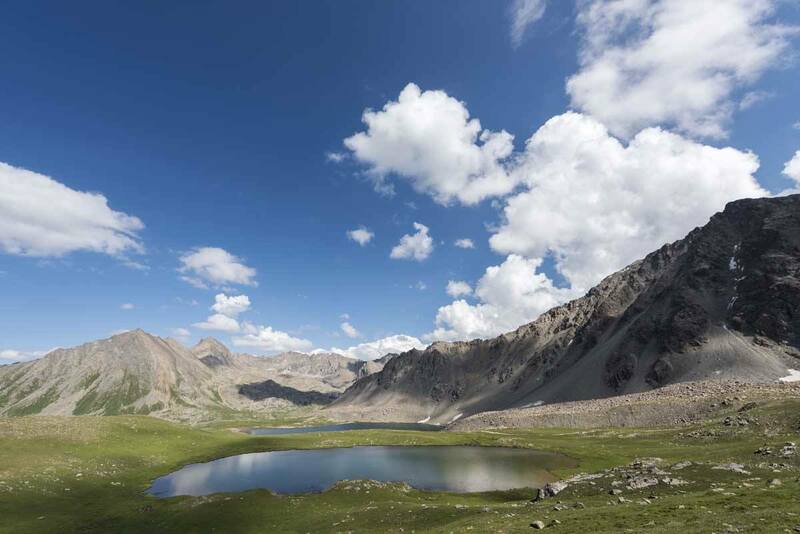 The full-day trek climbs 1600 meters and it’s only recommended if you’re in good shape. 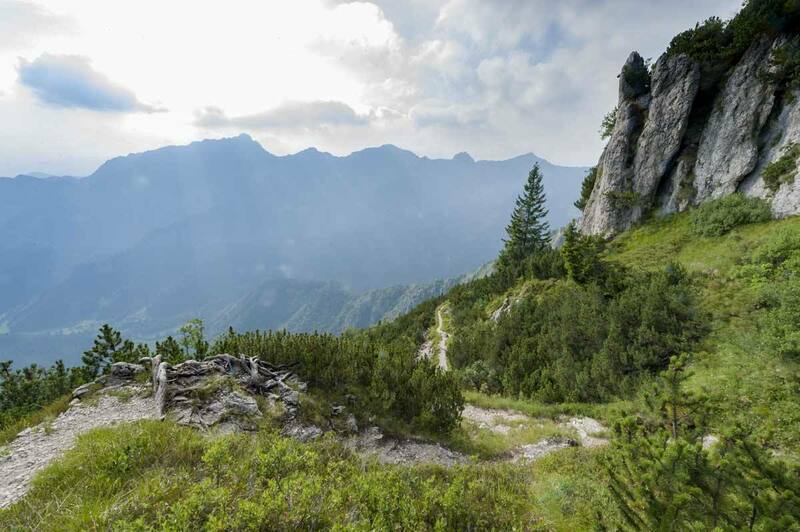 Or you can do what we did – drive to Malga Trat and hike from there. To do this you either need your own car (meaning you’ll need to hike back to the same spot) or you can arrange a lift with a guide or taxi. A taxi will probably set you off about €50, while if you need a good guide you can get in touch with Mauro or Andrea at Mmove.